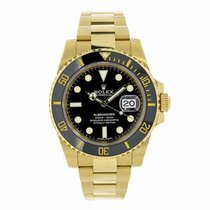 The watch of the world traveler, the Rolex Oyster Perpetual GMT-Master II in 18 kt. Yellow Gold is both rugged and sophisticated. The case of this watch is 18 kt. yellow gold measuring 40 mm enclosing the Rolex Calibre 3186 self-winding mechanical movement and is water resistant up to 100 meters/330 ft. The dial is an eye catching green color with extra bright luminescent markers and a date display at 3 o’clock, it is shielded by a scratch resistant sapphire crystal with Cyclops magnifier over the date. The yellow gold bezel is bidirectional working with the third hand of the watch as a 24 hour clock for a second time zone and features the Cerachrom black ceramic insert. The bracelet is the signature three piece Oysterlink design with a center row of polished links bordered by brushed gold links securing on the wrist with the fold over Oysterclasp featuring the 5 mm comfort extension link.